Michael Richards: Tar Baby vs. St. Sebastian is the first exhibition of work by the late artist Michael Richards at Francis M. Naumann Fine Art. Prominently featuring the sculpture Tar Baby vs. St. Sebastian, the exhibition—curated by Alex Fialho and Melissa Levin—will also include other sculptural work by Richards, as well as documentation of related works, and images of the artist in his studio. After being carefully stored in boxes for more than 15 years, much of the artist’s work has recently come back into public view due to the visibility of Michael Richards: Winged, a solo exhibition in 2016 (also curated by Fialho and Levin) at Lower Manhattan Cultural Council [LMCC]’s Arts Center at Governors Island. Tar Baby vs. St. Sebastian, 1999, is Michael Richards’ best-known sculpture. 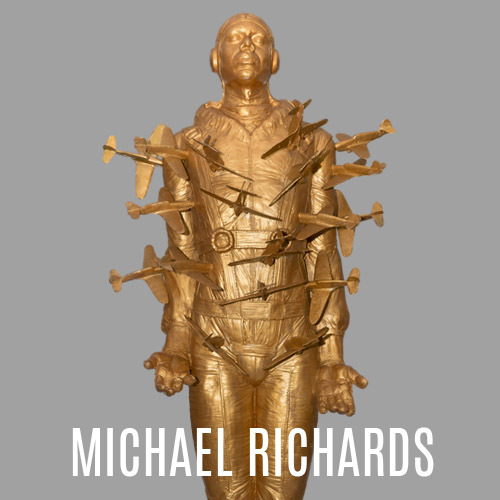 For the work, Richards cast his own body, outfitted the resin sculpture in the uniform of a Tuskegee Airman, pierced the torso with 18 small airplanes, and painted the figure gold. Tar Baby vs. St. Sebastian weaves together and recasts multiple narratives of struggle including those of the Tuskegee Airmen, the Tuskegee Syphilis Experiments, Joel Chandler Harris’ 1881 Uncle Remus story from which the character Tar Baby derives, and that of the early Christian saint and martyr Saint Sebastian. Charged with complexity in its approach to identity and history, and uncannily prescient in light of the circumstances that took Richards’s life, Tar Baby vs. St. Sebastian stands as one of the most important artworks of the 1990s. On the morning of September 11, 2001, Michael Richards (1963–2001) was in his LMCC World Views studio on the 92nd floor of World Trade Center, Tower One, when the first plane struck, taking his life along with the thousands of others who passed away in the tragic events of that day. At the time of his passing, Richards was an emerging artist whose incisive aesthetic—always provocative, at times playful, yet never without a critical bent—held immense promise to make him a leading figure in contemporary art. Francis M. Naumann Fine Art will be open as a site of remembrance on Monday, September 11, 2017 in honor of Michael Richards and the thousands of others lost on 9/11. The Tuskegee Airmen were a particularly important reference for Richards. The first African-American pilots in United States military history, fighting in World War II, Richards was drawn to the complexity of their triumphs in the face of segregation and discrimination. Incongruously, simultaneous to the pilots’ training in Tuskegee, Alabama, a group of black men at Tuskegee University were unknowingly enrolled in a clinical study to observe the natural progression of syphilis through the body. Richards was interested in calling attention to the uneasy duality represented by “Tuskegee” and its prominent, conflicting famous and infamous associations. Tar Baby is a fictional character in Joel Chandler Harris’ 1881 Uncle Remus story, in which Br’er Fox makes a doll out of tar and turpentine to ensnare his rival Br’er Rabbit; the more that Br’er Rabbit fights to get loose from the Tar Baby, the more entrapped he becomes. In contemporary dialogue, the term has taken on the valence of a derogatory term or slur used to describe a black person. Richards’ titular reference to this folklore points to America’s deep entanglement with racism. At a time when it was punishable by death to be Christian, Saint Sebastian (256–287 AD) was bound to a stake as a live archery target. A longstanding history of artistic representations of Saint Sebastian depicts the figure in ecstatic agony with multiple arrows puncturing his skin. He is now known as the patron saint of soldiers, athletes, and those who desire a saintly death, and is also a queer icon in relationship to pleasure and penetration. A sense of faith and fate are brought together here, as the 18 airplanes that puncture Tar Baby vs. St. Sebastian place the Tuskegee Airmen in dialogue with this biblical story of martyrdom. Materially and conceptually, Richards used the language of metaphor to investigate racial inequity and the tension between assimilation and exclusion in his art. Aviation, flight, and escape were central themes of Richards’ work, gesturing towards both repression and reprieve from social injustices, and the simultaneous possibilities of uplift and downfall, often in the context of the historical and ongoing oppression of black people. 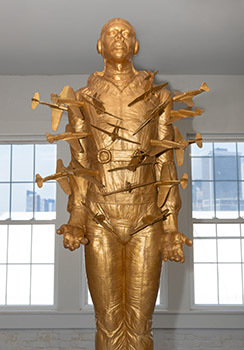 In light of the harrowing loss of Michael’s life on September 11, the airplanes, wings, and pilot imagery that recur throughout his body of work take on a prescient significance, perhaps most notably in Tar Baby vs. St. Sebastian. Though this charged afterlife of the artwork plays a central part in Richards’ story, it is crucial to a nuanced understanding of Richards’ artwork to read its multivalent imagery and metaphoric possibilities in the context of his own words and the socio-political climate of his lifetime as well as the continued powerful and disarming relevance of those poetics and politics today. An exhibition of Michael Richards’ work will take place at Stanford University's Stanford Art Gallery from January 22–March 24, 2019, accompanied by an academic symposium. Image credits: (L) Detail of Tar Baby vs. St. Sebastian, 1999, resin and steel, 90 x 36 x 24 inches. Photograph by Etienne Frossard, courtesy of Lower Manhattan Cultural Council. 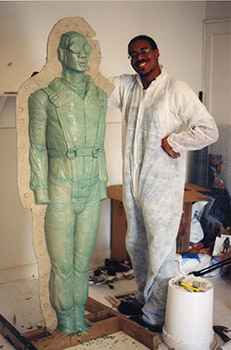 (R) Michael Richards in his studio, Miami Beach, 1998. Courtesy of Carolyn Swiczcz.